Monument derived from the artist’s thinking about the randomness of life and the tenuous space that separates life from death. The four major works reference the Australian bush where Berg grew up andsuggest change; the beauty, aggression, potential and wonder found and experienced through life in constant movement. This body of work was dedicated to Kirstin’s brother Shaun. Dena Kahan’s current work derives from her close study of the assemblage of botanical specimens made from glass in the Harvard Museum of Natural History – known for over a century as the Glass Flowers Collection of Harvard. Kahan’s interest in the Glass Flowers collection, however, is optical rather than botanical, and reflects a longstanding fascination with the qualities and nature of glass. The folios of drawings in this exhibition relate to another Andrew Seward work called Study of Adaptive Ramification (Grevilea australis), which was curated into a major survey exhibition Capturing Flora: 300 years of Botanical Art. The subjects for many of the drawings in this show were souvenired from mountain top walks in Victoria, Tasmania and New South Wales over a twelve year period. MELBOURNE ART FAIR: Eric Bridgeman, Nici Cumpston, Catherine Nelson, Adam Norton. Frontier responds to the fight, flight and drive of the human spirit. With reference to Umberto Boccioni’s early 20th century sculpture Unique Forms of Continuity in Space, Coad’s work alludes to the Futurist preoccupations with dynamic movement and speed. Coad’s skillfully painted figures emulate aspects of a military training regime and depict human physiology pushed to its extreme. However, by using a young female model rather than a soldier, Coad represents a more universal image of human potential. 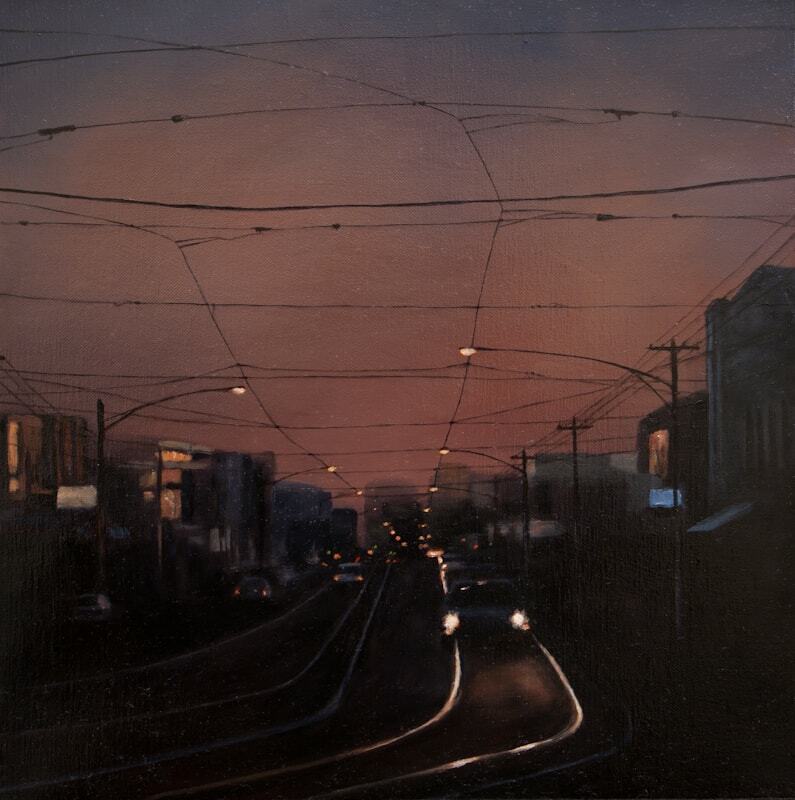 Brunswick East depicts inner-suburban streetscapes as the light fades from the sky and the twinkling illuminations begin to emerge. Through careful layering of oil paint on linen, Hammond renders quietly seductive images that reveal sublime encounters in suburban environments. In 1826, French explorer Jules Dumont d’Urville set out to circumnavigate the world in the corvette l’Astrolabe. With a crew including artist Louis Auguste de Sainson, l’Astrolabe anchored in King George Sound (the site of Albany, WA) on October 15th, 1826. During ten days on the south-west coast, the crew including de Sainson, explored the surrounding area and had dealings with the Minang people. De Sainson produced a number of sketches documenting the expedition which were produced as a folio of lithographs in 1833. The paintings in this exhibition are derived in part from de Sainson’s 19th century lithographs. These works explore the conflicts and connections between traditional indigenous culture and contemporary western ideologies. Geometric house floor plans float symbolically over carefully rendered scenes of traditional living while native and introduced flora morph into wall-paper designs featuring repetitive motifs and regimented decorative patterns. OUT OF THE DARKNESS: Chris Beaumont, Kirstin Berg, Dadang Christanto, Paula do Prado, Simone Eisler, Junko Go, Kirrily Hammond, Peter Lambropoulos, Catherine Nelson, Susan Purdy, Arryn Snowball, Valerie Sparks, Lisa Tomasetti, Stephanie Valentin.